In his element, greeting guests at any kind of function whether it is a corporate reception or a private party, Arbie creates a great welcoming atmosphere and loads of laughter! Each performance is customised and 'pre-programmed' specifically for the event with music, sound effects, logos and 'special' messages! At an exhibition or conference Arbie can 'front' a presentation or sales pitch, giving the facts in an engaging and entertaining way. 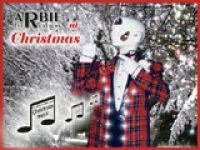 Bridging the age gap, Arbie adapts his performance and is equally at home entertaining nervous kids and elderly parents, as he is office partygoers and hard-core ravers! Arbie immaculately replicates the world's most sophisticated robots. The attention to detail is stunning and is so realistic that people will often search for the operator!